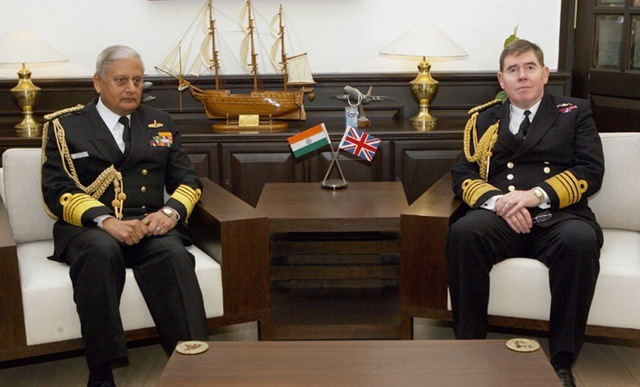 Admiral Sir Mark Stanhope, First Sea Lord and Chief of the Naval Staff of the Royal Navy is on six day visit to India from January 30, 2011.
to hold meetings with his senior Indian counterparts. to call on Defence Minister, Mr A K Antony. to discuss all aspects of UK defence and security policy including UK-India defence relationship, maritime cooperation. to deliver a keynote speech on Indian Ocean and Maritime Security at the National Maritime Foundation. to visit Mazagon Dock Ltd (defence shipyard). to hold discussions with Commander-in-Chief of Western Naval Command. On January 31, 2011 the visiting Admiral Sir Mark Stanhope called on Admiral Nirmal Verma the Chief of Naval Staff, Indian Navy at New Delhi. The above photograph is released by Press Information Bureau. Read more about the visit of Admiral Sir Mark Stanhope from the press release of the British High Commission, New Delhi.